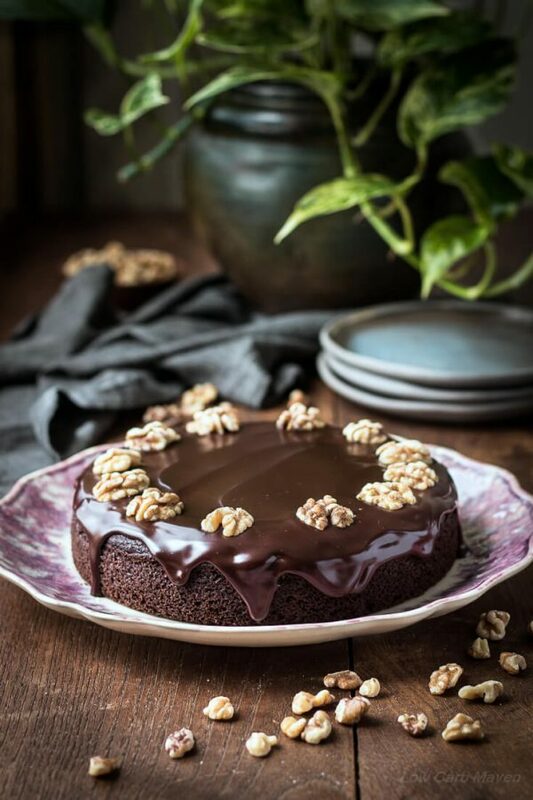 A lusciously moist Chocolate Walnut Cake made with almond flour and ground walnuts. It’s the perfect flourless cake for those who need a gluten-free dessert. The simple addition of a chocolate ganache glaze, transforms it into a stunning dessert. 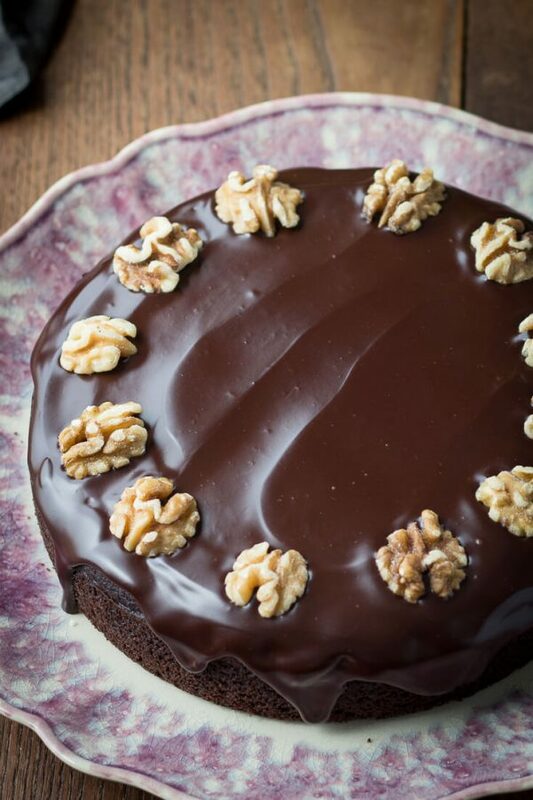 There’s nothing better than a lusciously moist chocolate cake – unless it has walnuts! This walnut cake recipe uses both walnuts and walnut oil to bump up it’s delicious walnut flavor. We all know that strawberries and chocolate compliment each other nicely, but we don’t often think about pairing chocolate with nuts. Walnuts and chocolate are an amazing combination. Enjoy this updated recipe and post! I love making desserts. I enjoy the whole process of coming up with an idea then testing and puttering with the ingredients until it comes out just right. Working with low carb ingredients can be a challenge. We use nut flours to make our baked goods and since they are completely flourless, they don’t share the same characteristic properties we are used to. One thing I particularly love about baking with our low carb flours is that they are completely gluten-free. 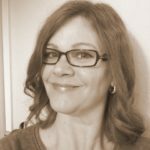 I know that I experience much less finger-joint pain and sinus troubles when I avoid wheat products – even the low carb products which sometimes have extra gluten added. The downside of using alternate ingredients is that the best results comes from combining them which means longer ingredient lists! 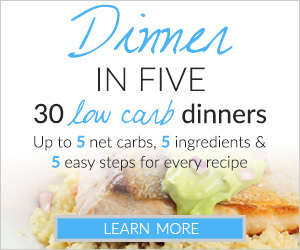 The upside is that our low carb cake recipes are usually 1 bowl wonders. That means we can add all of the ingredients to the bowl and mix away. And, over-mixing is never a problem. Nut flours, especially walnuts, are inherently moist and result in beautifully moist cakes and muffins, but they’re heavier than traditional flours and need extra leavening. As I remade this chocolate walnut cake, I paid attention to the procedure and found ways to make it easier. I also decided that it tasted better with a little more sweetener. Cocoa powder and walnuts are both bitter and the bump in sweetness really brought out some nice flavors. When I brought the cake out of the oven I was sad that I had waited so long to make it again. It smelled amazing! After the cake cooled, I made a quick chocolate ganache glaze. Then, I sorted through the nuts in my walnut bag and found 12 walnut halves to decorate the top. When originally posted, I used walnut pieces and sprinkled them around the inside edge. After taking photos, this beautiful cake sat covered on the counter for several days. The ganache was still glossy and beautiful and the cake became more delicious and moist. It was a real treat! If you refrigerate yours, make sure to let it sit out on the counter for 20-30 minutes before enjoying. 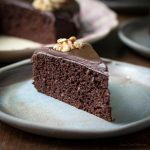 This chocolate walnut cake has a wonderful substantial texture, so a small piece is perfectly satisfying. It’s just as perfect to serve to guests as it is to enjoy cuddled up on the couch with your cell phone and a cup of coffee. [NOTE] I originally posted this recipe a few years ago – back when the whole family was eating gluten-free and dairy-free. At that time, I purchased coconut milk by the case. I used it as both the fat and moisture in my baking recipes. It lends a sweetness which I really like. However, in the process of updating the recipe, I replaced it. Don’t worry, I’ll still include it as an option. 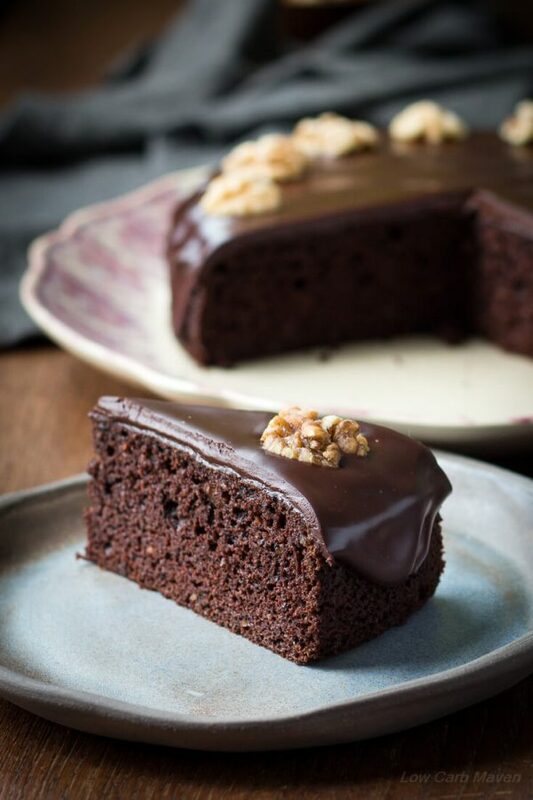 This Moist Walnut Chocolate Cake (Low Carb Chocolate Walnut Cake) is 5 net carbs per serving. 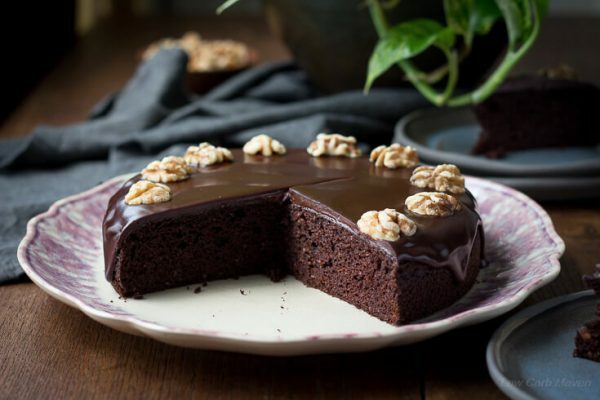 This Chocolate Walnut Cake is lusciously moist! Made with almond flour and ground walnuts it's the perfect flourless cake for those who need a gluten-free dessert. The simple addition of a chocolate ganache glaze, transforms it into a stunning dessert. Preheat oven to 325 degrees F and position rack to the middle of the oven. Trace the bottom of an 8 x 2 inch cake pan on a sheet of waxed paper or parchment. Cut out the circle. Spray the cake pan with baking spray and line the bottom of the pan with the parchment circle. Weigh walnuts and process in a food processor with the sweetener until a finely ground. Measure the dry cake ingredients (including the ground walnuts) in a medium bowl and stir thoroughly with a large whisk to combine. In another bowl, add the wet ingredients and beat with a hand mixer. Pour the wet ingredients into the dry and mix until all of the ingredients are completely incorporated. Spoon the batter into the cake pan and gently tap it on the counter 2-3 times to dislodge any big air bubbles. Bake for approximately 30-40 minutes or until the cake still sounds moist when gently pressed with your finger and a toothpick inserted into the middle comes out clean. Do not over bake! Remove the Chocolate Walnut Cake from the oven and cover with a clean tea towel. Let the cake cool completely. Then wrap in plastic wrap until ready to top with ganache. Make sure the cake is at room temperature before topping with the ganache. Finely chop the chocolate and place it in a small microwaveable bowl with the heavy cream and butter. Cover with waxed paper and microwave for 30 seconds. Let stand for 1 minute, then gently whisk to combine. The ganache should be thick and glossy. Use right away. Pour the chocolate ganache into the middle of the cake and spread with a spatula or knife, encouraging it to drip over the side. Decorate with optional walnut halves or walnut pieces if you wish, while the ganache is still soft. Cut and serve after the ganache has hardened (it will still be fairly soft but not runny). Store in the refrigerator or on the counter. If refrigerated, let it come to room temperature for 30 minutes before enjoying. Serves 12. Walnut oil is a pricey item. Get a good quality oil that is in a dark bottle. It will last a few years in the refrigerator. It's good in salad dressings and baked goods. I have had mine for 3 years and it's still delicious. If you use the metric system, take a peek at the U.S - Metric Conversion info linked to at the top of the site. It's Pinnable. 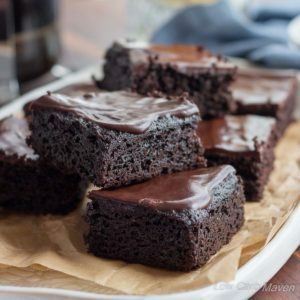 Martina’s Amazing Fudgy Keto Brownies! 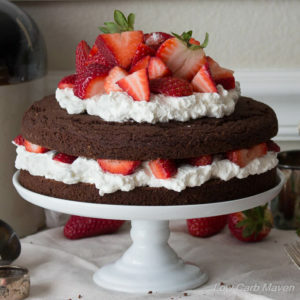 What size pan was used for the round version of this cake? Also, is do we really use an 8×2 pan? I’ve never heard of that size. Thanks. I am one of that unfortunate genetic minority who find stevia bitter at every concentration. Using less is simply not an option. 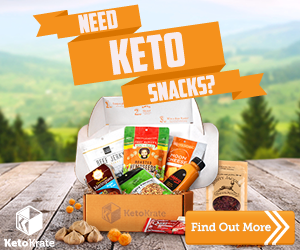 Would it be permissible to just add extra erythritol to the dry mixture, or to use a sweeter alternative such as xylitol or tagatose for the total sweetener? Hi Kim! I’d like to make this cake but only have a 9-inch round springform pan; would I need to scale the recipe up? If so, would you suggest increasing it by 25% or 50%? Thank you! Hi there! I’m fairly new to the world of low-carb baking and I need to make a low carb birthday cake for my brother-in-law this weekend. I have erythritol on hand already and am wondering what the ratio would be to substitute it for the Sukrin. I’ve never used Sukrin before but it looks like it’s made from erythritol so I thought it would be the same measurements but from a little research of conversion charts online, some people suggest doing 2/3 c. erythritol for a half cup of Sukrin. I’m also curious about the stevia glycerite, is this just a concentrated liquid stevia or something different altogether? I’ve found liquid stevia in my local grocery store but it doesn’t specify that is a glycerite. Should I order the stevia glycerite online or can I use the liquid stevia blend? I found it in the water enhancement aisle of the grocery store so it isn’t a concentrate. I am a little confused, in the directions it says to bake 30-40 min or until it “sounds” moist. I have never seen that in a recipe. I can tell when it feels moist, is that what you are talking about? I just made your cake. Actually, I made 2 because I’m having a birthday party for me tomorrow evening & I’m expecting about 15 people. I read all the comments & made sure I sifted & whisked my dry ingredients, but I was still worried that my cakes might come out dry, as some folks commented. If I had more time I would have done a practice run, but since I didn’t, I went ahead & added 2 more eggs & 2 more T of butter ( I couldn’t find the walnut oil) to the batter. The batter looked good & tasted great & the cakes look awesome. I checked them at 20, 25, 30 & took them out at 35 min, wasn’t going to risk over baking. I’ll post again to let you know on the actual taste & moistness of the cake after we dig into it. Anyway, I’m contacting you because I purchased the 86% chocolate for the topping, but it seems a bit bitter, as dark chocolate is. So, I was wondering if you would recommend adding some glycerine or Swerve (I couldn’t find the Sukrin) to the chocolate ganache glaze? Thanks in advance for your response & thanks for your recipe. Thanks for your response. I’m assuming when you say that the ganache might want to crust, you mean that it will harden or set quickly, so I have to spread it quickly before it begins to do this, right? I’m planning on adding 1 T of Swerve per cake topping. Do you think this is too much? I know we all have a different sweet tooth criteria, but just so you know, I really liked the sweetness level of the cake batter. Again your recipes & your time are greatly appreciated. I wanted to let you know that my cake turned out delicious. Thank you so much for your recipe. I over-heated my first attempt at the ganache, but on my second attempt I followed the recommendations you gave Sue and it turned out great. I made this the other day. I was anxious to try it. I have made several of your recipes. This did not work for me. I now have seen your comment about sifting the cocoa. Perhaps that is the reason the cake was very dry. I understand that. Then making the ganache, it looked great and then completely separated. I could not get it back together. I would appreciate your thoughts as I would like to try the brownies. Thank you……. Hi Sue. Sorry I wasn’t able to get to this until after I got my kids to school this AM. I’m sorry your cake came out dry. Yes, compaction of cocoa powder can absolutely cause a cake to be dry because you end up using more cocoa than the recipe calls for. Ovens do vary in temperature and I’m working with a 25 year old builder’s model gas oven. I would check the cake 10 minutes before “due time” to make sure it isn’t going to over bake. When done, laying a clean towel over it until it’s cool will trap in moisture. If you find any particular recipe to be dry upon making it twice (sometimes differing ingredients can be the culprit – for example Swerve has fiber in it and it may tip the balance?) you can add 2 tbsp of oil to the batter and it helps. These are tricks I have learned over the years. As for the ganache… Ganache usually breaks because the chocolate got too hot and it seized or water from a whisk or spoon (or steam) got into the mixture while trying to mix it together. It’s frustrating. It happened to me when I was making the Chocolate Truffles from Primal Blueprint which called for coconut milk. There was enough water in the coconut milk to cause it to break. No amount of stirring brought it back together. Heartbreaking. Next time, heat the cream first until hot, then add the chocolate and leave it alone for 5 minutes before stirring. Then add very soft butter and stir gently again. That should take care of the problem. I adore and love all of your recipes, and I have tried most of them, and every single one came out perfectly! My question would be can I completely remove Sukrin or any other sugar substitute from most of your recipes? I like to use Stevia Glycerite, but I have not tried your recipes without sugar substitute so I was just wondering can I somehow avoid it. This recipe looks amazing, I can’t wait to try it. I don’t have access to sukrin or the other option. 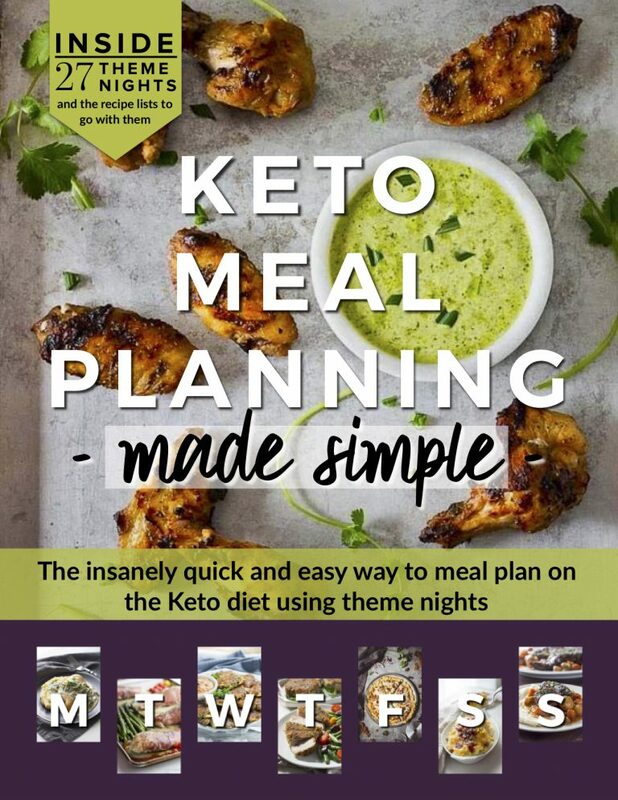 Can i use stevia instead and is it a 1:1 conversion? Does the nutritional information include the chocolate ganache? Is there anything you can substitute for coconut flour? I’m allergic to both coconut and almond. I use walnut flour in love of the almond flour. Hi! I don’t see how long to let the cake cool in the pan. Remove from pan after 10 minutes? Can I use pecans instead of walnuts. I have both the oil and nuts that I need to use up. Hi Kim…may I please have the original recipe …..the dairy free one? Have you made other changes too …that is other than using dairy? Would be nice if I could have that recipe please. Thanks. Hi Kim.. am unable to find the link for the chocolate coconut milk ganache in the recipe.Am I looking in the right place? Thanks. Hi! You mention that the sukrin is a 1:1 substitution. What about the glycerite? I live overseas and was wondering about subbing maple syrup? 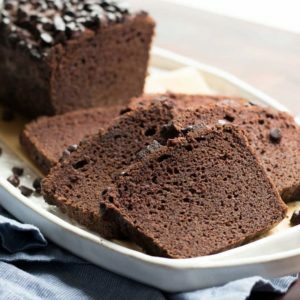 I have to say this is one of my favorite chocolate low carb desserts. Delicious!! Love, love, love!! Thanks for the great recipes. I am loving trying a new one everyday. What can you use if you don’t have stevia glycerite? I can’t wait to try this cake. I just bought a new bag of Guittard chocolate and it is calling my name. So simple, and yet, so beautiful! Looks like the perfect cake! One recipe make? And i am currently using Hersheys Dark Special cocoa. (3) Will that work here or do I need to adjust the amount of cocoa used? Thanks for being so prompt in answering our queries. I’m curious what kind of coconut milk is being used? The stuff in a carton or the full fat canned kind? Thank you! “Measure walnuts and process in a food processor until a fine meal. There will be some bigger pieces and this is okay, just don’t let it become a paste. Unclear to me if the walnut meal is added to the dry ingredients or used as the topping. I’m assuming it’s added to dry ingredients and chopped walnuts used as topping. I don’t process information as well as most, sorry. You’re cake recipes look terrific! I’d like to try this one. I use Swerve. How will the stevia glycerite be affected? Do I reduce the amount, not use it, etc? This looks amazing! Makes the choice on what to bake really difficult! Thanks so much….I’m thinking Easter cake! I didn’t see the size of cake pan used – 8″? Thanks. I really love your website and the way it looks, Kim!